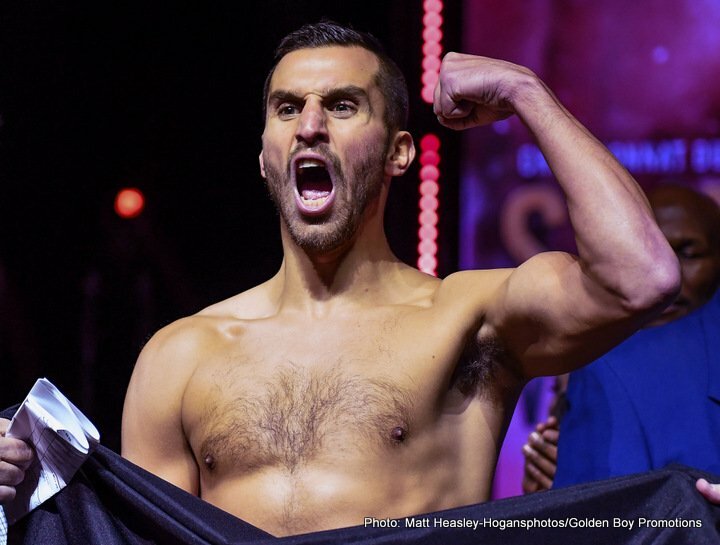 Last night in Quebec, Canada David Lemieux returned to action for the first time since his wide decision loss to Billy Joe Saunders in December. Pounding out a very wide 12-round unanimous decision of his own against Karim Achour, the former IBF middleweight champ won pretty much every minute of every round as he picked up a commanding 120-107, 119-108, 119-107 points victory. Lemieux is now 39-4(33). Achour of France, who has never been stopped, falls to 26-5-3(4). Lemieux’s biggest battle proved to be on the scale at the weigh-in the day before last night’s fight. Looking drained and somewhat tired, Lemieux actually failed to make the 160 pound limit, tipping-in at 162 instead. The former champ could simply get no lower and it is clear his future lies up at super-middleweight – as Lemieux himself has said. Lemieux, despite being weakened from his efforts at trying to make middleweight, still had more than enough against non-puncher Achour. Having this his own way throughout, Lemieux dished out plenty of heavy punishment with little concern over what was coming back at him. Lemieux put the icing in the cake with a knockdown in the 12th and final round. Achour deserves much credit for being able to hang in the way he did. So what next for Lemieux? We can forget about any rematch with Saunders, or of any more big fights at 160. The power-puncher has boxed a few of his other fights above the 160 mark and it doesn’t figure to be too much of a problem for him to fight at the full 168 from here on in. There are of course some big names operating at super-middleweight and Lemieux, when fully fit and full of energy and power, has a chance to defeat just about any of them. In a slugfest type fight, Lemieux is very hard to beat – with only the great Gennady Golovkin managing to subdue him (that and, a long time ago now, in a huge upset, the loss to Marco Antonio Rubio). Imagine the excitement we would be treated to if Lemieux fought the likes of Gilberto Ramirez, James DeGale and David Benavidez. At age 29, with just those four losses, Lemieux has a lot to offer still.